Commercial technology is limited when it comes to directed evolution. For example, flow cytometers offer incredible throughputs (100,000 cells per second), but cannot sort in response to a ligand, and most commonly only measure fluorescence intensity, side-scatter, and forward scatter. In contrast, selection of E. coli expressing improved clones an agar plates, the most common method for developing new fluorescent proteins, has very limited throughput and selection criteria, and is semi-quantitative at best. To overcome these limitations, in collaboration with Prof. Ralph Jimenez (University of Colorado, JILA, and NIST), we created highly-quantitative and high-throughput multiparameter microfluidic systems for the directed evolution of FRET sensors and red-fluorescent proteins. 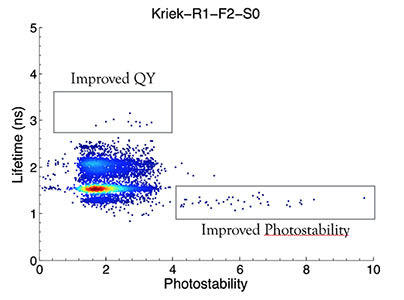 Importantly, these versatile cytometry systems could be reconfigured to measure other biophysically insightful parameters, including photoactivation, anisotropy, fluorescence emission spectrum, dark-state relaxation, and more. We are currently working on two different microfluific cytometry systems: a red-fluorescent protein cytometer and a FRET sensor cytometer. The red-fluorescent protein cytometry system combines CW photobleaching and frequency-domain fluorescence lifetime measurements with optical (1064 nm) sorting, providing the basis for selecting new red-fluorescent proteins with improved total photon output. Current sorting rates are 10-20 cells per second, and anticipated sorting rates in the near-future are between 100-200 Hz, providing the capability to screen libraries with 100’s of thousands of members in a matter of hours. The data gained by this method provides direct insight into how photophysical parameters coevolve with one another. Sorting of a red-fluorescent protein library based on two different photophysical properties, fluorescence lifetime and photostability. Boxes indicate proteins that were selected for further analysis. 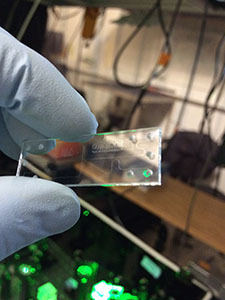 The FRET cytometer combines ligand addition, droplet generation, and dielectrophoretic sorting of mammalian, yeast, or bacterial cells expressing FRET sensor libraries. Importantly, this system provides the opportunity to identify improved sensors based upon the ligand, kinetics, binding affinity, and dynamic range, simultaneously. Manna, P., Hung, S.T., Mukherjee, S., Friis, P., Simpson, D.M., Lo, M.N., Palmer, A.E. & Jimenez, R. Directed evolution of excited state lifetime and brightness in FusionRed using a microfluidic sorter. Integrative Biology : Quantitative Biosciences From Nano to Macro 2018. In press. Fiedler, B.L., Van Buskirk, S., Carter, K.P., Qin, Y., Carpenter, M.C., Palmer, A.E. & Jimenez, R. Droplet microfluidic flow cytometer for sorting on transient cellular responses of genetically-encoded sensors. Analytical Chemistry 2017, 89(1):711-9. Dean, K.M., Davis, L.M., Lubbeck, J.L., Manna, P., Friis, P., Palmer, A.E. & Jimenez, R. High-speed multiparameter photophysical analyses of fluorophore libraries. Analytical Chemistry 2015, 87(10):5026-30. Dean, K.M., Lubbeck, J.L., Davis, L.M., Regmi, C.K., Chapagain, P.P., Gerstman, B.S., Jimenez, R. & Palmer, A.E. Microfluidics-based selection of red-fluorescent proteins with decreased rates of photobleaching. Integrative Biology : Quantitative Biosciences From Nano to Macro 2014, 7(2):263-73. Davis, L.M., Lubbeck, J.L., Dean, K.M., Palmer, A.E. & Jimenez, R. Microfluidic cell sorter for use in developing red fluorescent proteins with improved photostability. Lab on a Chip 2013 13(12), 2320-7. Lubbeck, J.L., Dean, K.M., Ma, H., Palmer, A.E. & Jimenez, R. Microfluidic flow cytometer for quantifying photobleaching of fluorescent proteins in cells. Analytical Chemistry 2012, 9(5):1425-34. Ma, H., Gibson, E.A., Dittmer, P.J., Jimenez, R. & Palmer, A.E. High-throughput examination of FRET-detected metal ion response in mammalian cells. J. Am. Chem. Soc. 2012, 134(5):2488-91. Dean K.M., Lubbeck J.L., Binder J.K., Schwall L.R., Jimenez R & Palmer A.E. Analysis of red-fluorescent proteins provides insight into dark-state conversion and photodegradation. Biophysical Journal 2011, 101(4):961-9. Schafer, D., Gibson, E.A., Salim, E.A., Palmer, A.E. & Jimenez R. Microfluidic cell counter with embedded optical fibers fabricated by femtosecond laser ablation and anodic bonding. Optics Express 2009, 17(8):6068-73.